To enter ​Prague Castle, you'll need to purchase tickets. Tickets can be purchased within the Prague Castle grounds at the information centers found in the second and third courtyards of the castle. The map that you get with your tickets will help you to navigate the castle grounds and identify the structures for which you've purchased tickets. There are several types of tickets to Prague Castle that will permit you entry into groups of buildings within the complex. Three types of tickets allow for entry into multiple buildings rather than only exhibitions. These are called Circuit A, Circuit B, and Circuit C. Please note that these are tickets for self-guided tours. They do not include the services of a tour guide. Tickets are valid for two consecutive days. If you purchase tickets on the first day and see only some of the castle complex, you can come back the next day to view the rest, which is particularly good for those who want to cram in as much sightseeing as they can while in ​Prague. Also, remember that entry onto the Prague Castle grounds is free, so if you get hungry or tired in the middle of your tour, you can leave and come back later. 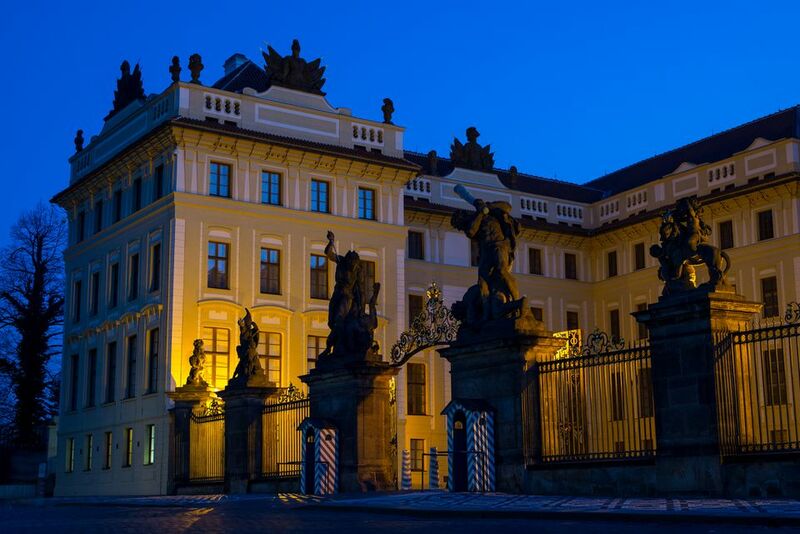 The ticket for Circuit A includes entry into the Old Royal Palace with the exhibition tracing the history of Prague Castle, St. Vitas Cathedral, St. George's Basilica, Golden Lane with Daliborka Tower, the Rosenburg Palace, and the Powder Tower. This is the most expensive ticket, but if you plan to explore the castle complex thoroughly, this is the ticket that you want to buy. The ticket for the Circuit B includes entry into St. Vitas Cathedral, the Old Royal Palace with the exhibition tracing the history of Prague Castle, St.
George's Basilica, and Golden Lane with Daliborka Tower. The ticket for Circuit C includes entry into the Prague Castle Picture Gallery and the exhibition about the treasures of St. Vitas Cathedral. Tickets for entry into individual structures can also be purchased for: The Story of Prague Castle exhibition in the Old Royal Palace, the Prague Castle Picture Gallery, the exhibition on the treasures of St. Vitas Cathedral, the Great South Tower, and the Powder Tower. Discounts are given to students under 26, children ages 6-16 (children under the age of 6 have free admission), families with 1-5 children under 16 with 1-2 parents, and seniors over age 65. If you want to take photos within Prague Castle, you'll have to purchase a photo license. Just be sure to turn off your flash. You can't arrive at Prague Castle expecting to get in on a guided tour. Guided tours in the language of your choice must be arranged for in advance. However, you can rent the audio guide of Prague Castle, which offers you the freedom to explore the castle complex at your leisure. This major attraction can seem overwhelming, and viewing all the exhibitions and interiors can be tiring. But having a good plan and ready energy will ensure that you'll agree it's one of the city's best attractions.